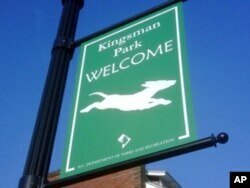 There’s lots of room for romping - for both mutts and their mistresses and masters - at this bark park in Mecca, Florida. A popular trend in American landscape architecture is the dog park or, as the Chicago Tribune newspaper calls it, the “bark park.” There are now thousands of these fenced areas for dogs to play off-leash, some of which have one section for big dogs and another for little ones. Canines are getting their own pleasure grounds because in most American towns, you can be fined for letting your mutt run free. But in a bark park, dogs of every breed and size can frolic, meet and greet, and feel absolutely free to leave their scent on trees and shrubs. Their owners have to remove whatever else they leave on the grounds, though. Since 1997, Chicago has built 11 such parks - or what it calls “dog-friendly areas” - including a veritable Versailles Gardens for pooches in Grant Park. That’s a people park on Lake Michigan, across from Chicago’s famous “Loop” of downtown skyscrapers and elevated subway tracks. The 1,200-square-meter bark park features wrought-iron gates, ornamental trees, dog waste receptacles and lots of small, plastic pick-up bags. It’s clear who the special invited guests are at this park in Washington, D.C.
There’s even a miniature version of Grant Park’s spectacular Buckingham Fountain for splashing. Dog haters, of course, aren’t always happy about such expenditure of public funds. Having all these hounds together, they say, will mean you’ll constantly be stepping into - well - dogfights, for one thing. Rarely, reply Chicago’s happy dog owners. And the more dogs we segregate in the bark park, they add, the more of the “people park” you grouches have to yourselves.